Unclutter My Life. Day Four. Music to inspire the process and technical issues. There has been a gap in my efforts to get on with the decluttering. This is mainly to do with my WordPress issues. I have spent hours exploring ways to find a solution to the issue, the problem being I have used all the space on my free WordPress site. I then stupidly deleted photos from my posts because I am a ditz, spent ages uploading photos to Flickr as I thought I could link them to WordPress from there (if you can, I cannot work out how to). Spent even more time debating whether to go self hosted and how much will that cost and how the hell do I do it and basically having a digital meltdown. Why has that got in the way of the decluttering process? Blogging and photos of the progress is very important to me on this journey. It is giving me a visual record of progress made. I am faced with a huge task and somedays I look at it and don’t know where to start. That depresses me, the negative thoughts creep in, I beat myself up for letting it get so bad and tell myself that I will never manage to get this house clean and neat and saleable. At that stage, and because it is sunny, I go in the garden and read. Shut the door on the mess that is my house. What is different today? It is my day off work and I promised myself that I would get back on task. I want to go on holiday in September. I want this house up for sale next summer. And I am going to see a good friend on Sunday who may just help me out with my WordPress issues. Confession time. The decluttering was a by product of deciding to clean the sitting room. I could write my name in the dust on the tv stand. When the sun hits the window I could see that it needed cleaning. I didn’t want to go in there it was so depressing. First of all the vacuum cleaner was full. 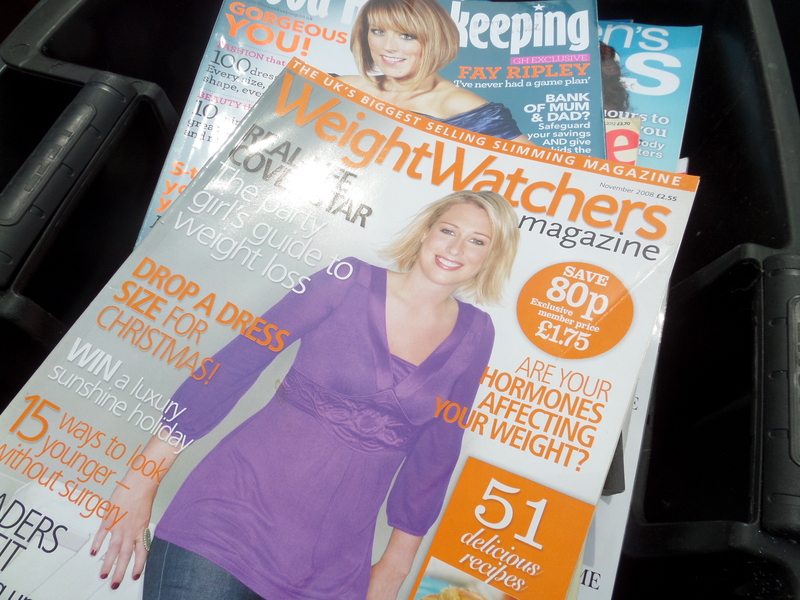 Then I noticed that on the shelves were yet more bloody magazines. They went in the recycle bin. The oldest one today was from 2008. I was fat then and am fat now, lot of good buying that did me. Once they were off the shelf I noticed that the shelves were really dusty as were all the books on the other shelves. If they are that dusty this must mean we never look at these books. Right those can go too. A bag now sits in the hall to go to the charity shop. 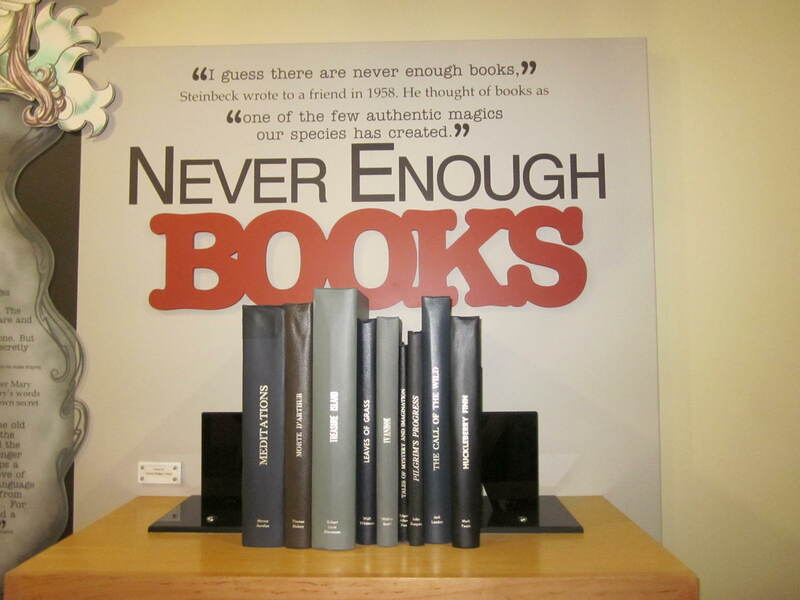 Steinbeck, I am sorry, I disagree. In my house at least, I really do not want or need more books. This is what I started with. 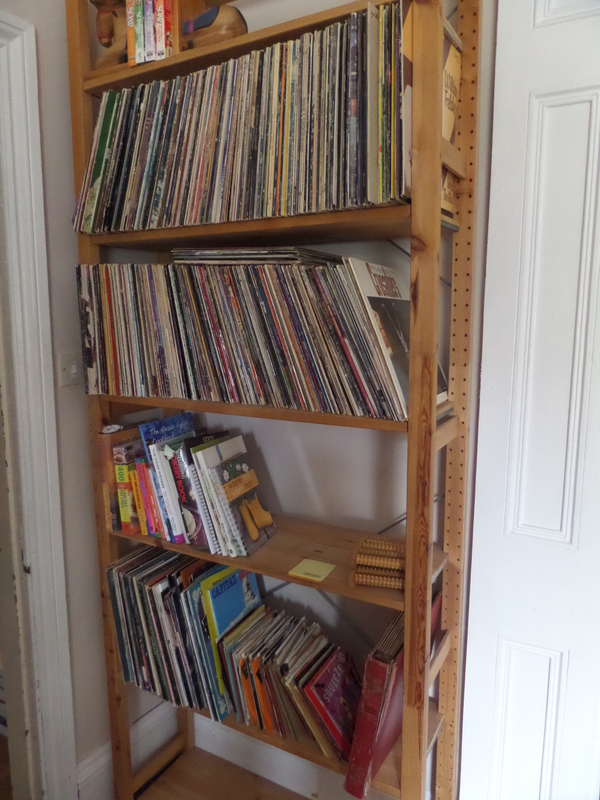 An hour or two later, with Adele, Fleetwood Mac, Crosby, Stills, Nash and Young for company, the shelves are sorted. All the vinyl in one place. 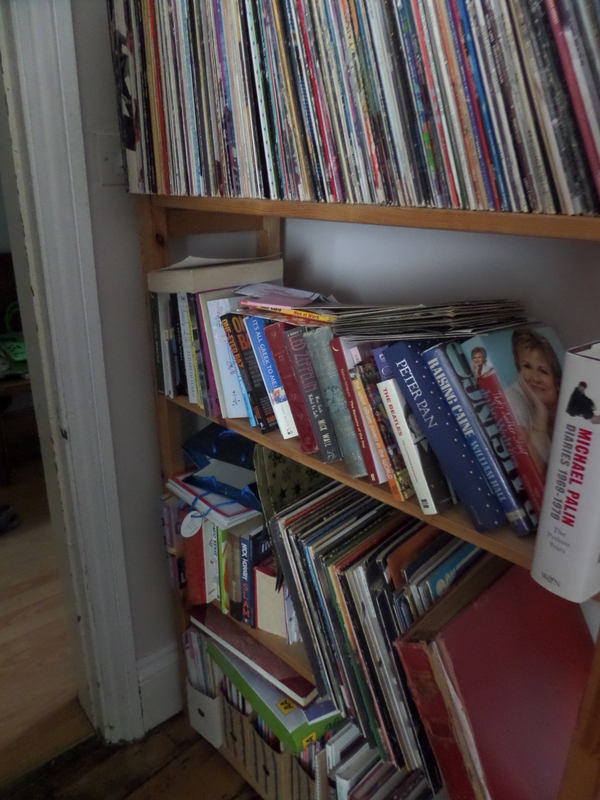 What remains of my cook book collection is no longer on the floor, where they have been for the past few days. And clean shelves. It so much easier with good music blasting out, I even did a bit of dancing like no one is watching. And I clean, tidy shelves. Now to get that vinyl in alphabetical order… see number 21 of 30 Things Vinyl Collectors Love. This entry was posted in De cluttering, Health and Wellbeing and tagged books, cleaning, declutter, decluttering, digital meltdown, Flickr, uploading photos, Vinyl, WordPress by Travelling Coral. Bookmark the permalink. Definitely can link to flickr photos from wordpress. My post http://tgroom57.wordpress.com/2014/06/18/tomato-relish/ links to a flickr photo. Flickr have changed the user interface. Get your photo up in flickr. Click on the bendy arrow “share this photo” bottom right of screen. Mine defaults to providing the link, but click on ‘HTML’. The top box gives a choice of sizes, the bottom box gives the code to copy & paste into WordPress, into the ‘text’ tab. Then click the ‘visual’ tab et voila! Thank you so much for explaining this to me. People were telling it me it was possible and I was picking up the link and pasting it into the visual tab. Which didn’t work. Simple when you know how. I debated whether to mention my ‘issues’ in this post, would I look stupid? I don’t choose the words sometimes when I write, they just appear on the page and I go with the flow, just as well. Again, thank you.